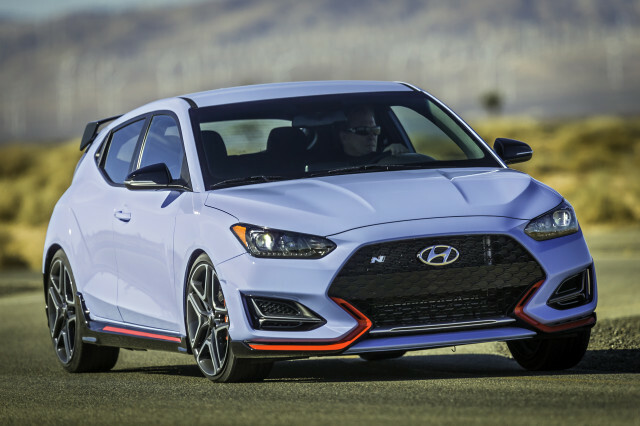 Pricing for the 2019 Hyundai Veloster N has been announced, with an MSRP starting at $27,785, including destination. Opting for the N Performance package will add $2,100. Standard performance equipment for the base Veloster N includes the 250-horsepower turbocharged inline-4, a six-manual tranmission with rev-match downshifting, five different drive mode settings, an electronically controlled suspension, ventilated brakes, 18-inch wheels, Michelin Pilot Super Sport summer tires, six-way manually operated sport seats and an N-exclusive steering wheel. Other standard equipment includes LED headlights, proximity entry and push-button start, automatic climate control, two USB ports, Hyundai’s 8-inch touchscreen, Apple CarPlay, Android Auto and an eight-speaker Infinity audio system. The N Performance package ups engine output to 275 horsepower and adds an electronically controlled limited-slip differential, a variable exhaust, 19-inch wheels, Pirelli P Zero tires, and larger brakes. For comparison sake, the Volkswagen GTI starts around $28,500, the Honda Civic around $25,000 and the Ford Focus ST (may it soon rest in peace) around $26,000. So it’s cheaper than those, but is it still a performance bargain? For an in-depth answer to that, click below to see how the Veloster N’s performance specs stack up for the money versus those very competitors.